MERRY CHRISTMAS! Presents for me, anyone?? XD Nah, just joking. 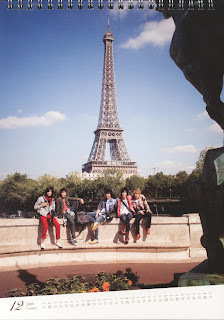 If there is, gimme the Bonjour Paris photobook. Hehe. I know some of you guys have plans on Christmas day. Unfortunately, I don't have any. Even I had to work on Eve's day. Okay, that was a voluntary decision cuz I didn't wanna lose RM72. At least I'm one step closer to getting a new cellphone. Any good phones to recommend? My budget is RM400-RM750. I was thinking of getting the Nokia 6300. Oh boy, another item to add to my wishlist -_-. How am I gonna spend my Christmas? Let's see...I'm most likely staying at home & celebrate with my lappie. I might glue my eyes in front of the TV the whole day to watch Dong Bang DVDs. Or continue my drama marathon session; I still have loads to watch - Air City, 世界の中心で、愛をさけぶ, Galileo. Not to mention another disc left to watch from All About 東方神起 Season 2. And I bet I won't be able to finish all of the videos before uni starts. Ack! So, Christmas ain't Christmas if it's celebrated without the usual traditions. 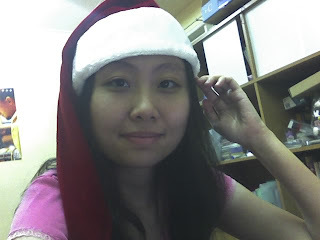 My tradition is to wear a Santa hat & snap a pic of myself. This kind of arrangement started when I first bought my Santa hat in 2002. I think I missed last year's cuz I didn't have a camera at that time. Oh wait, I did take it but only showing my head with the red hat. Anyways, since this year is the turning point of my life - officially an adult & eligible to vote - I intend to post up pics (in chronological order) of my own pics wearing a Santa hat. Just to show how much I have grown over the years. Bet that I didn't change much but who cares. Not now, of course as I have to dig up my older pics. They're not in my lappie. Meanwhile, enjoy this pic of me with the Santa hat for 2007! It's December! The time for joy & the end of another chapter in life. I'll be receiving this photobook calendar in a week or two but I still wanna share the pic. Paris is lovely, no doubt. The place is even more lovely when the boys are around XD. Okay, I shall stop my biased statements ^^. Have a good day & in a few days later, it's farewell to 2007. Cherish the moments while it lasts.